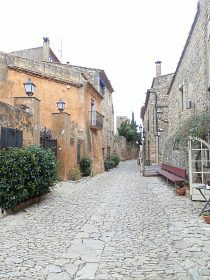 Palau-sator and Peratallada are small very picturesque medieval towns/villages situated just outside Pals (which is itself very picturesque). 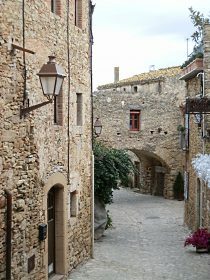 Of the two, Peratallada is the prettiest and for me, is actually prettier than Pals, though because it sits in a shallow valley, it lacks the prominence of Pals village. 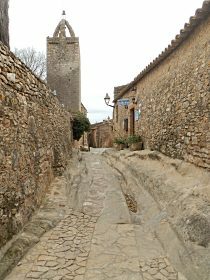 Peratallada (which I believe means cut stone - pedra tallada) has a moat around one side literally cut into rock, and walls and gates surrounding a maze of cobblestone streets and golden stoned houses. Palau-sator is smaller and less refined and has rings of houses around the central castle/tower. 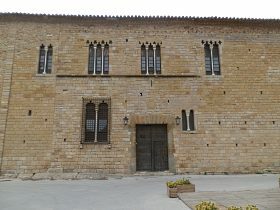 A feature of the two villages, and a number of other rural villages and masias (farmhouses) is the number of restaurants. Both villages, though small, have a disproportionate number of restaurants in the villages. Though tourists use them, in reality, unlike the coastal resorts which are mostly geared towards the influx of foreign holidaymakers, these restaurants are much more local and authentic. And so on a weekend at lunchtime they tend to fill up with Catalans out for lunch. We sometimes hear of people looking at holidays on the Costa Brava who worry about coming out of season in case places will be shut. Well yes, some places in the coastal resorts do close through the winter months, particularly the more tourism-focused places. The better restaurants and bars that can and do attract a more local and year-round clientele tend to stay open. And in practice you find many more of these inland than you do at the coast. However, to appreciate and get to the restaurants you have to be appreciative of the Catalan hours and eating habits. Broadly speaking, people in Spain do not eat in the early evening and in particular, around the Costa Brava, locals will tend to have their main meal during the middle of the day and will take their time over the meal - so say start at 2pm and finish some time at or after 4pm (the Catalans have the same breakfast-dinner-tea-supper pattern as Northern England - alternatively imagine every day is like Sunday or Christmas dinner, eaten in the middle of the day). If they go out again it will be after 9pm and often only at the weekends. You would think, having been here for a while and having done a reasonable amount of walking, a simple walk like Palau-sator to Peratallada that we've done before on bikes couldn't go wrong. 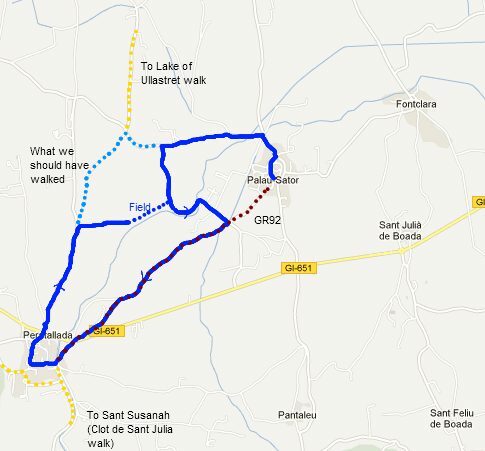 The distance between the two villages is around 2-3 km, so not far The idea was to make a circular walk - the main route would be the GR92, but there's a path past the church outside Peratallada so we should be able to make a loop. We got hamstrung with two problems - firstly we took the wrong map, and secondly we took the wrong turn, so we didn't quite do the walk we wanted and ended up having to track across fields to make the link. The other thing is, that by our standards, it's actually not that great a walk - the countryside is fairly flat and level and mainly fields, so it's much more of a gentle stroll through the farmland without many points of interest on the way, unless you count the pig farms and the wafting country smell they generate. We started at Palau-sator. Palau means palace, but really refers to a large house or castle in the town (Palafrugell and Palamos have the same Palau root). The restaurants were busy, so parking was haphazard though there was space. We took the time to take in the town including the odd stone igloo well and clock tower. From the village we followed the path towards Ullastret to start with - this is mainly tarmac but quiet. Having bought the wrong map and relying on memory we knew we needed a left-hand turn. Unfortunately we took the turn too early and looped around the village. Which then bought us back to the GR92. This was supposed to be the route back, so instead we took the flat walk down to Peratallada. 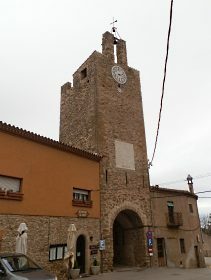 Peratallada is one of the hidden and lesser-known gems we always take relatives too. Often they've heard of Pals, but know nothing about Peratallada. We followed the river to the ford, and then entered into a small square with an arched arcade that represents the main entrance. In summer or when they have craft markets, the town throngs with people. It's then a question of exploring the myriad of narrow streets, archways and bridges over the road and the part where carts have worn tracks into the stone of the road. The exit point it to the north, the roads in the town wind their way to the top and a stone gate. If you go through the gate, you find yourself on a bridge above a moat cut out of the stone. 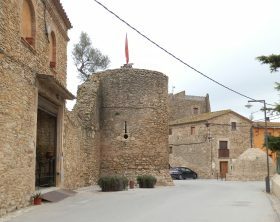 What with the French, pirates and brigands almost all catalan villages had to be able to defend themselves from attack. Leaving the village we head past the church and out to the north. This path is slightly raise with a wood to the left, so has a little more character. Once again though we got lost. We thought we could find a short cut and took a track to the right, only to find ourselves at the edge of a field. Rather than go back we went around the field to link up with the path we came on. If we'd continued on the route would connect to the Gualta, Llabia, Fontanilles walk to the north. Or for another extension, from Peratallade, it connects to the Clots de Sant Julia walk to the south. We just happened upon Palau-Sator last week and had a lovely off-season dinner at Mas-Pou. Loved this small walled village & hope to return some day. Enjoyed your post & photos. Cheers!